Here's a shot of the extruder designed to use the Tamiya Universal Gearbox, no lathing required. The Tamiya shaft is replaced with a 2.5mm hex key, and that fits into an M5 grub-screw locknutted on to the top of the M5 extruder drive. There is a crude thrust bearing (locknuts & washers) inside, and half a drilled M5 nut to support the drive screw where the filament presses against it. It's mechanically complete but needs wiring up with a working opto board and a thermocouple - which are in the post. Yes, I know I'll have to paint the opto vanes or stick tape on them. So Simon, here's your new extruder :) Actually I'll tidy up the models a bit and run you off a fresh one. The modelling has been done in BRL-CAD, exported with g-stl to STL format, then repositioned with ArtOfIllusion, saved as an STL again, converted to g-code by skeinforge and then sent to the Gcode RepRap "Phoenix" by the Java GUI program. It's a convoluted path but I kept on having snags at every darned step! With the exception of the opto-board, all the pieces were sourced in New Zealand (which bodes well for other places). 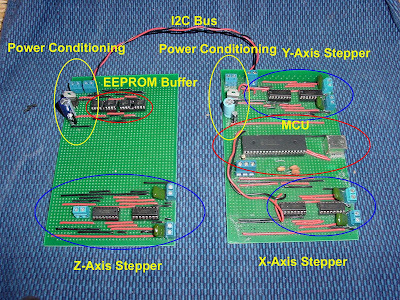 One day, I'd like to stick this on an I2C control bus so everything can be controlled from an Arduino without running out of pins! It can take either a 16mm PTFE extruder barrel or the no-lathe heatsink one as shown. The clamp fixture is compatible with Darwin interchangeable extruder holders - I checked :) I'll post the files after their final tidying. We've done a video on RepRap for the finals, and we think it makes a good general introduction to the project too. There is a new release of the Java host software and the Sanguino firmware that support accelerations and decelerations during building. 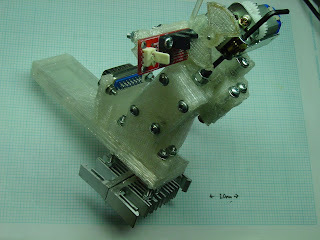 Accelerating RepRap from Adrian Bowyer on Vimeo. Unfortunately the new firmware is now too big to fit in the Arduino ATMEGA 168 controllers (though the old version that does is still available, of course). However, there is plenty of room in the Sanguino, and we will be supporting the Arduino Mega as a RepRap controller soon. The new firmware buffers all movements, and so communications with the controller are now asynchronous. This completely eliminates all pauses between one movement and the next. The main advantage of the new code is that you can run the axis motors at much lower current (as they don't have to hit the feed-rate requested in one step from a standing start) while not compromising build times; indeed, you can set higher maximum feed-rates as the machine now accelerates up to them and decelerates down. It’s not often one gets to spring up to a podium to collect a prize, and even rarer in merely Bermuda shorts and bare feet. However, this didn’t put the judges from Bath University’s post-graduate conference from giving the RepRap project first prize. In which your narrator turns designs into hardware with remarkably little trouble... Do you want to read more? Wow. Finally. Four months ago I bet Adrian a Mars Bar that we could get this working, and now finally here it is – the Bowden extruder. By decoupling the motor from the carriage, we now have a ridiculously small extruder head. The implications of this with respect to machine design are wonderful: less dead space around the build volume leading to a more compact overall design, simpler carriage constraints, improved stability through elimination of moments and less energy required to move a lighter mass. The key to this is a low-friction PTFE tube (a nod to Ian here for finding a supplier). Thanks to the archaic imperial system it is possible to get tube with an ID of 3.175 mm (1/8”) to give a nice running fit for our 3.0mm PLA filament (this is one of the few times you will witness me thanking the imperial system). Once cleaned up, we were pleased to be unable to spot the difference between builds from the first pinch-wheel extruder (back, I think) and this Bowden extruder (front, I think). The PTFE tube can be super-glued into it’s respective housings (here ABS & PEEK) provided it is sufficiently roughed up with a file. I got my PTFE tube (1/8” ID, ¼” OD) from Adtech. I just rang Samantha there and she said if you mention the word ‘RepRap’ she might be able to sell you some without the minimum order charge.